Orbit Industries 1-Gang Weather-proof outlet box in gray color, features powder-coated die-cast copper-free aluminum construction. 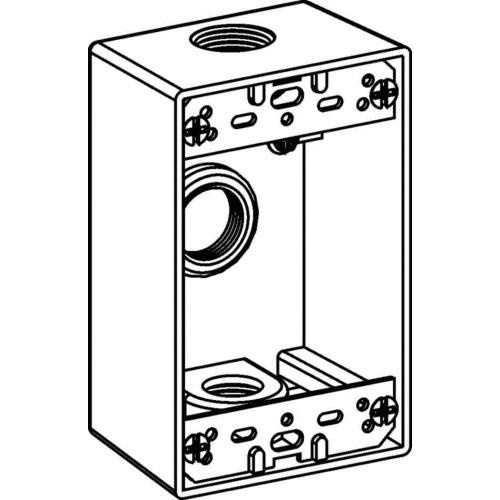 This rectangle box measuring 2-3/4-Inch x 4-1/2-Inch x 2-Inch, has capacity of 18.3-Cubic-Inch. This box comes with lugs and two closure plugs for proper installation. It has three holes of size 1-Inch. It has NEMA 3R rating for safety. Box is cULus listed and RoHS compliant.